We take donations only via PayPal. You can use your debit or credit card to send money via PayPal. The Donations button will be coming back shortly. 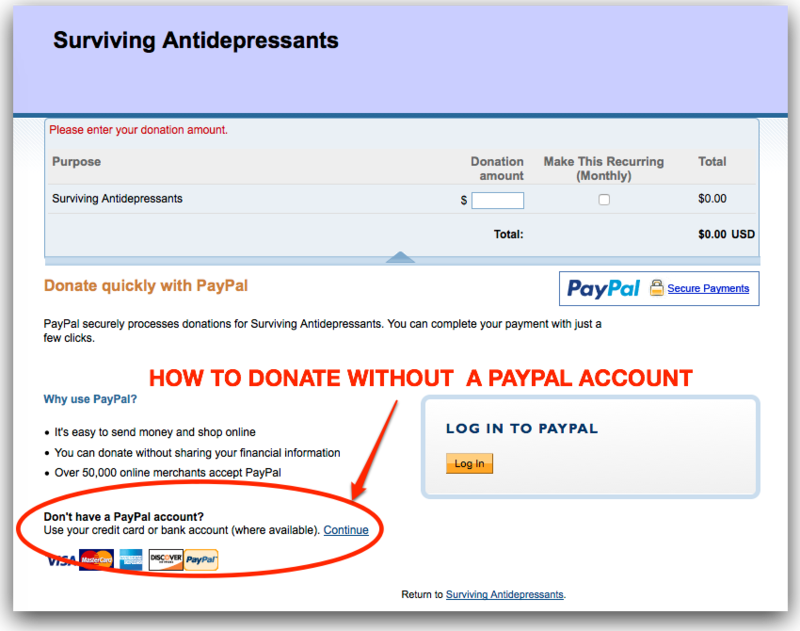 If you feel Surviving Antidepressants is helpful, please consider a voluntary donation. Surviving Antidepressants receives no funding from any source other than its members. It does not make a profit. We are not sponsored by any organization or religious group. We certainly do not receive any support from pharmaceutical companies! We will never run advertising. This site's purpose is only to provide support for people withdrawing, reducing suffering, and bringing the problems of withdrawal to the attention of medicine. 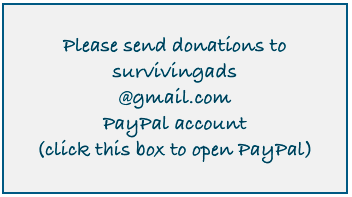 Donations are made through PayPal, which accepts all major credit cards, even if you do not have a PayPal account. It will translate foreign currencies into US dollars. If you wish to support the site in other ways, such as directly paying for hosting or software or providing expert technical advice, please contact the administrator. Thanks very much for considering donating to Surviving Antidepressants. Very gratified by the donations received already. I know many of you are not in the plushest of circumstances, your support in this way and in others means so much to me. You can use credit cards and bank cards for payment. PayPal will accept a PayWeb virtual debit card, available from some banks in Europe and in the U.S. or at https://payweb.com/. If you have questions, PayWeb has phone numbers in various countries, see https://payweb.com/eng/contactor send them e-mail. This is a virtual debit card: You go to your bank or its Web site, purchase the "card" in a certain denomination, and you get a "virtual debit card number" to use. After you deplete the amount of money on the "card," the number becomes invalid. This is a good way to make Web purchases with high security for your bank account or credit card. A heartfelt thank you to all who have donated. As the site grows, our expenses will increase. Your contribution, however small, is very much appreciated -- it keeps the site "on the air" for everyone. Is there another way to do this? Paypal and I don't get along. They sent out stuff recently that I had to sign in order to continue with them... didn't like it... didn't like what it said... didn't sign. Don't ask me what it was about... I can't remb now. Thank you for that question, summer. You can donate without a PayPal account, using a credit card or debit card. 1) Click on the use big yellow Donate button on the Donations page. 3) Click on the Continue link. 4) Be sure to choose your country on the PayPal page. 5) Enter credit card or debit card info for payment. 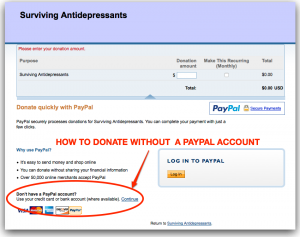 If you don't want to put in your credit card or debit card info, you can get an electronic "money order," see http://survivingantidepressants.org/index.php?/topic/210-donations-gratefully-accepted/?p=3199, or you might be able to get a gift card for one-time use from your bank. Also, folks -- I want to say, even though you may be getting an automated thank you, I am personally very grateful for the donations. I know few of us have money to spare. You're keeping this site going. I would send personal notes but -- the PayPal receipts I get don't have your screen names on them and different e-mail addresses and I often don't know who exactly they're from. Try clicking on the Send Money link in the upper part of the PayPal home page. It looks like I can do that but it requires an email address. What should I use? To send a PayPal donation to this site, use survivingads at comcast.net (but with the @ sign). It is asking me to sign in to Paypal. And of course, they never sent the password I had forgotten. cs, I guess you'll have to contact PayPal again. Their phone service is pretty good. Click on Call Us on this page https://www.paypal.com/cgi-bin/helpscr?cmd=_help&t=escalateTab. Jackson, thank you for all your help. I know people sacrifice to donate, it means all the world for us. But don't give more than you can afford! Is there any other possible way to send donation? My husband won't let me use card online. I would be happy to send a check if you will allow that. I read where someone else asked that but I don't like mooching and would like to show my appreciation. I too am disabled and can't contribute a lot but don't want to lose you. Besides I feel I owe it to you for all your help and want to help in return. Thank you, Tezza. I'm sorry, SurvivingAntidepressants.org doesn't have a bank account. PayPal is our bank. You can probably get a prepaid credit card through your back. This is for one-time use, hackers won't be able to get money from it. For example, you can give your bank $10. They give you a one-time credit card. Click on the PayPal button a the top of the page. Enter your information and the number of the prepaid credit card. Cut the card up and throw it away when the payment goes through. I purchased a prepaid debit card, tried to use it with PayPal. It didn't go through so I called them. I was informed they will only accept a bank account debit card or credit card. Very sorry for the inconvenience, tezza. I spoke to PayPal and found an address has to be associated with a prepaid card. They suggest you phone the credit card company or go to their Web site and get an address put into the system. Thank you again for wanting to donate! I want to thank everyone who has sent a donation, including those who are not members! Your donation allows SurvivingAntidepressants.org to "broadcast" tapering information throughout the world. While we have hundreds of members, hundreds of thousands of anonymous people read our tapering topics from the Web, without becoming members. Thank you again for making SurvivingAntidepressants.org available as a resource for everyone. Is there a way to donate other than through PayPal? Sorry, we take only PayPal. Can't find it in the Mobile phone version. I'll get to a pc, but it might be a good idea to have it available for folks with phones for when the spirit moves 'em. I recently got a message that the site would not accept my annual contribution. Could be my card is expiring, but that's next month. Please let me know if anything is wrong. No, that must be a PayPal glitch. Please contact them. And thank you so much for your donations! Donated as much as I can afford, went thru easily using Paypal............. thankyou so much,,,,,,,,,,,,,, so much damn cheaper than therapist! Keep up your wonderful work. Just a question I see no one's asked before - is SA set up on Amazon Smile? SA needs the money so I could raise money for it and set up a charity donation page? In September 2017 I will be walking 100k (62 miles) as a training walk for my "biggie" walk of 630 miles which will be early in 2018. Do let me know how much money SA could benefit from and I will make it my target. PayPal is the only payment service we have set up so far. Junglechicken, that's very kind of you. I think that might be very complicated. How about raising money for CITA in the UK? That might be easier for you. Alto, it wouldn't have been a problem. There is Mind.org.uk which is a large UK mental health charity which I could raise money for. Do you think SA can get charity status in future? Charity status is rather complicated in the US. I don't see it in SA's near future. I see, I didn't realise that. My guess would be there are too many hoops to jump through? Well, I haven't given SA it's Christmas present yet so must do that. I wonder where my money went then... brain fog is so bad it will be hard to sort.... but my pay pal account has been screwed up for years so I know I did not send SA money that way...but I did send money. I just tried to make a Xmas donation (NOT using Paypal as I don't have an account), and was unable to. It kept telling me "looks like you may have account, please login". You can use a charge card on PayPal without having a PayPal account, but you have to go through PayPal. Thanks for thinking of us. I don't see the yellow donate button at the top every page? I've read this thread and still can't find the Donations page. It was on the site before the change of software.